Since the beginning of Baremetrics, especially when we started making our data public through Open Startups, I am regularly asked “What is normal?” around all sorts of data points. This led to the creation of Open Benchmarks, which lets you dig deeper in to all sorts of metrics about the SaaS industry at large. But what it doesn’t really give insight in to is just how much of a slog it can be building a SaaS company. It’s called the long, slow SaaS ramp of death for a reason. I get a lot of selfish feel-goods digging through our substantial data set and seeing what the trends are across nearly 1,000 SaaS companies, so I thought I’d start doing a sort of SaaS Data Deep Dive series here on the blog to see if it’s useful to folks. Today, we’re going to take a look at Annual Run Rate (or ARR), which is just your monthly recurring revenue (MRR) multiplied by 12. It’s what businesses typically use when they talk about the size of their business, from a revenue standpoint. 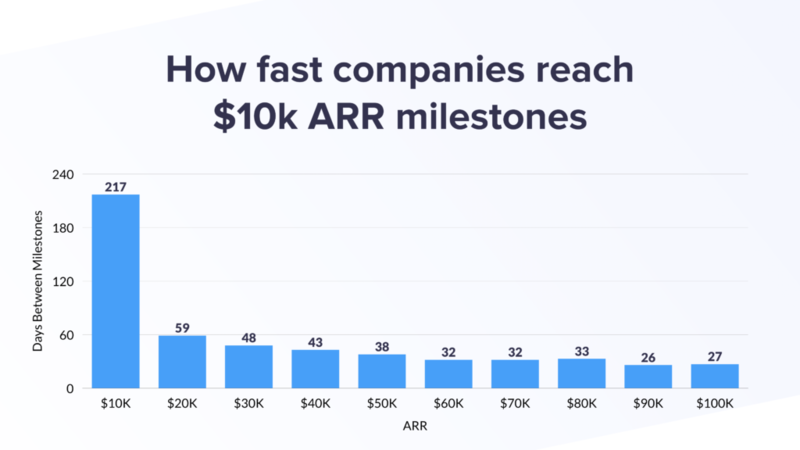 How fast do SaaS companies reach $10,000 ARR? An annual run rate of $10,000 means about $833 in MRR. That may not sound like much, but getting to that first $10k in ARR is quite a trek! Once you pass that first hurdle, subsequent $10,000 milestones are reached at a much faster pace. But even then, many companies never get out of the “multiples of $10k ARR” realm as it can be demoralizing to keep pushing for that long. On average, a year in, the graph shows that most SaaS companies are only doing $40,000 ARR (or, about $3,333 in MRR). That’s not enough to sustain a single person, let alone a team and it’s why so many SaaS tools never really get off the ground and become something bigger. How fast do SaaS companies reach $100,000 ARR? Here’s the realm where things start to get slightly more interesting. At $100,000 ARR, you are likely at a point where at the very least you are working on it full-time, and you could probably have another employee or co-founder and maybe even some part-time folks. But, as was the case with the $10k ARR milestones, the first $100k ARR is long and difficult. After that? Things speed up quite a bit. Most companies double their ARR from $100k to $200k in a third of the time! To me, the $100k to $200k journey really highlights why SaaS can be a great business model. The compounding effects of customers continuing to pay you on a recurring basis makes growth much more stable. 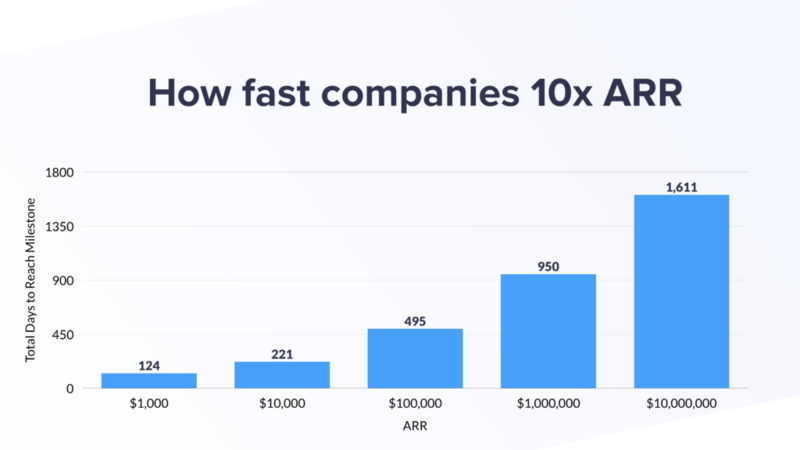 How fast do SaaS companies reach $1,000,000 ARR? $1M in annual recurring revenue! The holy grail! 😛 For many, hitting $1M ARR feels unachievable. It takes the average company nearly two years to get there, and that’s if they even survive that long. 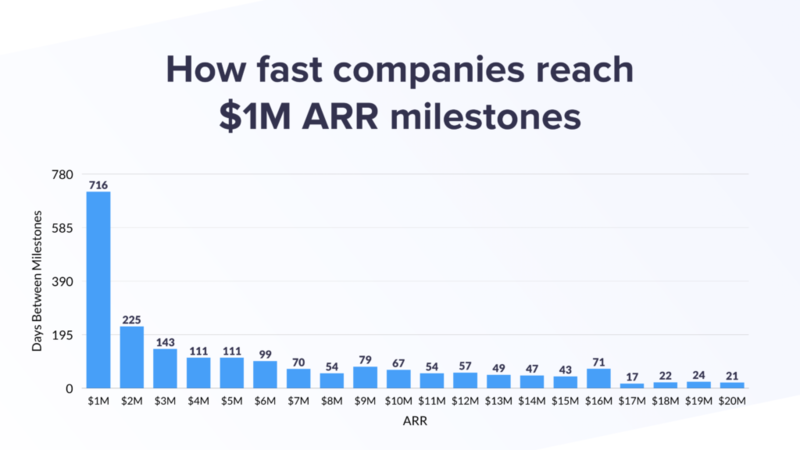 The next $1M still can take quite some time, but after you hit that $1M ARR milestone, you likely have many more resources at your disposal. Where it starts getting a little dangerous is if you start pouring fuel on the fire before you’ve really proven there’s a highly scalable business there. Real talk: We here at Baremetrics have hit a bit of a plateau at about $1.2M ARR. For the past year, growth has largely been flat. We’re profitable, but not excessively so and would really love to figure out why things have plateaued. Lots of things in the works to address it and we’ve even hired a Head of Growth to focus solely on that issue, but I just wanted to reiterate why reaching $1M ARR doesn’t mean you’ve reached some pinnacle and it’s all roses from there on. The world of high-growth SaaS loves to talk about 10x’ing things and getting a taste of that delicious hockey stick growth. So here’s a chart that shows how long it can actually take. Keep in mind, those latter columns have a bit of confirmation bias in that there are countless companies that never reach those milestones. But even the ones that do, it takes years. That’s years upon years of founders sticking it out in a highly stressful environment where, more days than not, they’re probably privately second guessing every decision they make and wondering if it’s all worth it. So, there we have it. What’s your experience been with ARR milestones at your company? Also, what do you think of this data-deep-dive format? Should I do more of these? Let me know in the comments!